I am addicted to winter squash but I need to figure out a safer and easier way to peel it! The peel is so hard that it is even challenging to use a vegetable peeler. Usually I just struggle through with a peeler, but the squash soup from last week broke my peeler. For the rest of the squash I tried to use my chefs knife but I was worried about hurting myself. – If you don’t need it in pieces and you are using it for a puree then roast it first. Afterwords you can scoop out the flesh. – Cut it into large chunks, then peel the smaller pieces with a paring knife.Cut it into chunks, roast it and then peel off the skin with your fingers. – Steam the squash for 4 to 5 minutes then allow it to cool. It should now be soft enough to easily peel with a peeler. – If you need to peel an acorn squash first slice off the top and bottom with a sturdy knife. Cut in half lengthwise, remove seeds and pulp then slice each of the ridges apart by slicing down each of the ridges. You can know use a regular peeler to peel it. 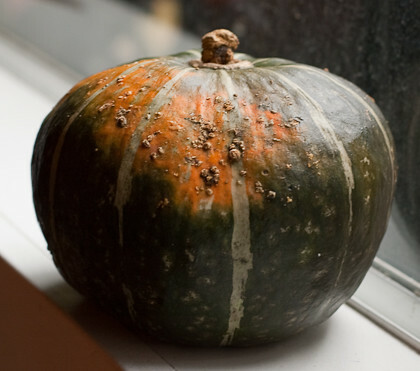 I found information on peeling winter squash in many spots, like here, here, here and here. But what do you think? What do you usually do to peel winter squashes like acorn, butternut or kabocha? Here are some of the great winter squash recipes I have made, some involve peeling and some don’t!